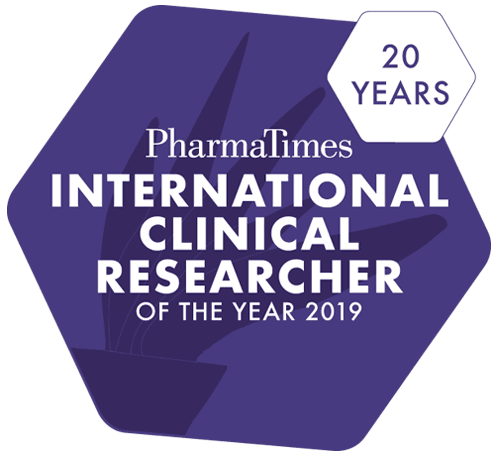 Comprising three stages, the PharmaTimes International Clinical Researcher of the Year competition is free to enter and is open to all levels of clinical researchers working within the pharmaceutical industry. Nominations may also be made, and where this is the case, PharmaTimes Media will contact the nominee and invite them to enter. International Clinical Researcher of the Year 2019 is now closed for entry. This is an online multiple-choice questionnaire prepared by the Institute of Clinical Research (ICR) consisting of 20 questions based on ICH/GCP questions. The pass mark to move forward to Stage 3 is 80%. One re-take is allowed. Successful candidates from stage one are invited to complete a category specific 'Clinical Challenge' devised by the competition's Executive Steering Group. Submissions should be no more than 1000 words. PharmaTimes Media sends all of the essays to the judges without telling them who they have been written by. The authors and the companies they work for are only revealed at a special meeting of the executive steering group – in what is often referred to as ‘the unblinding of the essays’. The top performers are then invited to compete in the finals (Stage 3). No preparation is required prior to the finals. Judges are drawn from the competition steering group – and entrants are only judged by people from outside their own organisation. All finalists receive valuable mentoring and feedback on individual performance from the senior clinical judging panel together with a signed certificate. The winners will be announced at a gala dinner and awards ceremony in London. All finalists will be recognised and will have the opportunity to network with some the leading voices in clinical research. The awards ceremony will take place during May at a soon-to-be-revealed London location. To make a reservation before tickets go on general sale contact Samuel McIntyre at: samuel.mcintyre@pharmatimes.com T: +44 (0)1372 414240.